St. Petersburg is over 300 years Young! Today we visited the original city of St. Petersburg – founded by Peter the Great is 1703. The site of the original city is an island of great military importance located in the middle of the Neva river. The fortress is the traditional star fort – that means that the walls zig zag out and in – and cover each other from all sides. But sometimes the best adventure comes on the way to your destination! We started the day on the metro – getting off at the stop nearest the Fort. Our original plan was to first see the Museum of Political Life – but it was closed. What is it about this trip that things are closed or otherwise unavailable. Did we not do enough research. Really! Anyway – this actually turns out to be a good thing because when we do get to visit the Museum – it’s a full day adventure in and of itself! 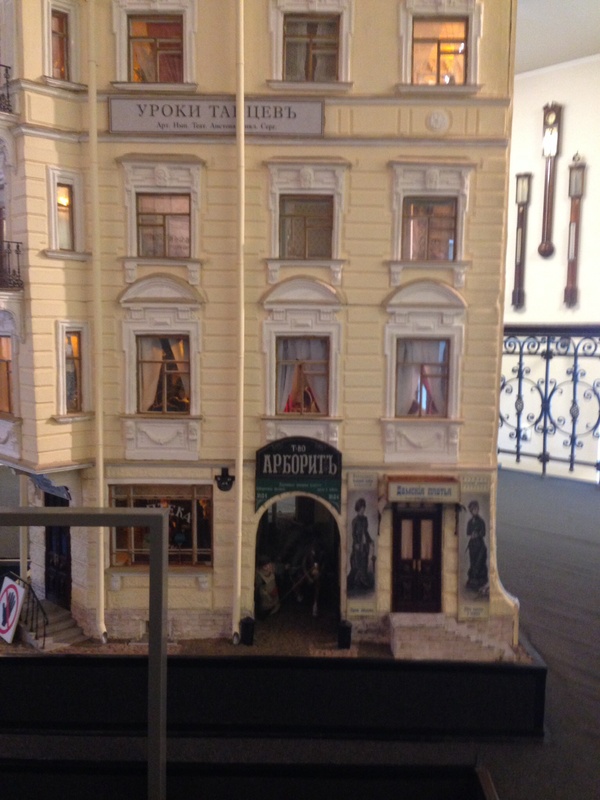 Russians seems to do museums on a truly grand scale – but more about the Museum of Political Life later. Moving on – we pass a lovely pond, kids feeding ducks – people drinking coffee. In mugs. Wait a minute – those are not take-away paper cups – those are mugs. Where’s the restaurant? It’s actually hidden inside an artifical cave dug into the park. On one side is a set of steps on a grassy knoll – no hint that a restaurant exists. On the side near the duck pond (well – more of a dove pond actually – based on the number of birds of each type) is the door to the restaurant. I do a dead stop, hard right into the restaurant. I’m dying for lack of coffee at the Suricata – and here’s the perfect antidote! And it’s very reasonably priced. I’m in heaven. IT gets tea, MP gets 2 latte’s, and I get a latte and a pastry. Latte is fab – pastry contains goat cheese. So I eat the top and bottom – IT gets to enjoy the center portion! Suitably refreshed – we head on to the fort. Having never suffered from battle – the fort is entirely original. There’s a rather lovely cathedral inside that contains the tombs of most of the Romanof rulers – even Nicholas II is interned here – his remains and those of his family recovered and moved here in 1998. The very best part of the fort is the Commandant’s House. The begining rooms which cover in way too much detail the founding of the island and the building of the fort – are fairly dull – but once you get up stairs – the museum really picks up the pace. 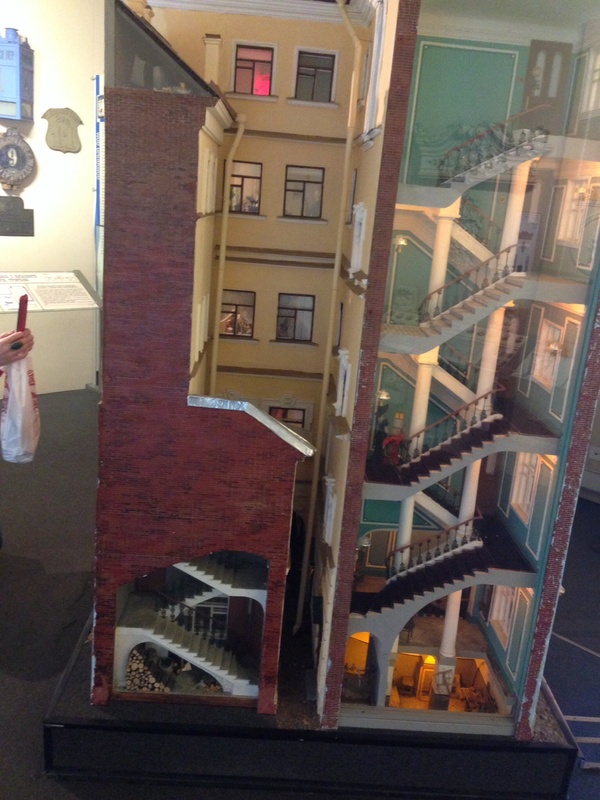 My absolute favorite parts were the section on the house styles of St. Petersburg – and an absolutely hilarious silent movie section featuring a couple having an arguement. The wife throws the husband’s brandy, newspaper and pipe out the window – the husband responds by throwing the wife’s latest purchases – and the delivery boy out the same window! I laughed so hard – I embarassed IT! The section on house styles in St. Petersburg – at least in the historic heart – was very interesting. We’d recognized that the Suricata Hostel was rather uniquely designed with a central courtyard – but it wasn’t until we saw this exhibit that we realized that all the houses that haven’t been heavily renovated are of this design. The entrances from the street are ALL for businesses on the first floor, or in the case of the most fashionable apartments or small ‘palaces’ – entrances to grand staircases. The normal residents all enter via the courtyard – and from there into the houses. Cool. Naturally – the most elegant homes would have 2 staircases – one for the owners – and one for the servants. 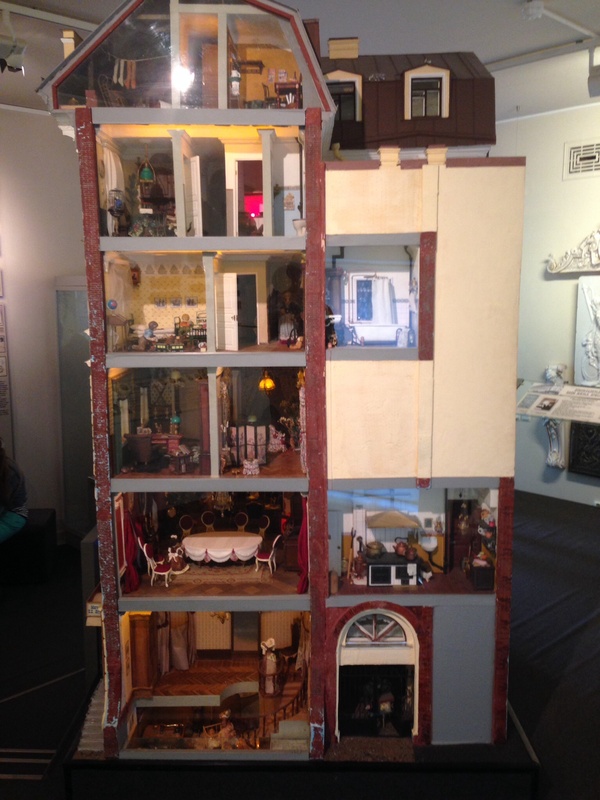 I couldn’t resist taking pictures of the doll house they had built to show how the houses are laid out on the inside – this despite actually living in one! Other exhibits I found interesting talked about how indoor plumbing arrived in the city – including fixtures like necklace showers – an obvious pre-cursor to the rain shower. I totally enjoyed this museum – and I really liked their toilets. They were the only free toilets we saw on the island! Another highlight of the Fort was the quick view of the beaches we had. St. Petersburg is dark for a lot of the year – and this time of year – when days are really long, and night lasts only 4 hours – are highly valued. So if the sun is out – out come the sun bathers! IT, MP and I are wearing our long sleeved shirts and long pants – these folks are lying on cobblestone walkways in their bathing suits! We naturally saw the requisite bride and groom – Peter and Paul Fortress is a well known spot for taking wedding pictures, and we sat in the giant metal chairs that form a piece of abstract art in a different part of the Fort. Doll house view of old St. Petersburg house. Instead of taking the metro home – we opt to walk across the Neva on the suitably named Troitsky Most. A lot colder and windier then we’d thought – we are well chilled by the time we reach the summer garden – and gleefully opt for a quick dinner out. Our unfortunate choice was the Barcelona – I know – why Spanish in Russia – but hindsight is always better. Good news – the Sangria was delicious. ← Is there no end to the Hermitage?